Have you ever wondered why a Chinese vase is decorated with peony blossoms? Or peaches? These auspicious symbols often represent hidden wishes for happy marriage, prosperity, long life, peace, and more. Learn about these symbols and others as revealed through Ming and Qing dynasty porcelains and jades in this unique exhibition. You will see more than 140 exquisite artworks–many of which were made for the Chinese imperial courts–that shed light on the time-honored tradition of auspicious symbolism in Chinese culture. 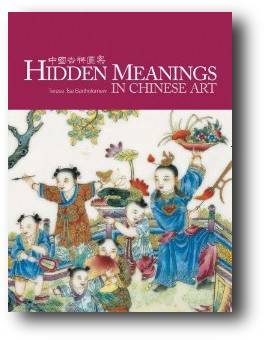 Hidden Meanings in Chinese Art brings a systematic approach to the cataloging of such hidden meanings. The book is divided into 10 chapters, guided by the 3 Star Gods, Fu (blessings, happiness), Lu (wealth, rewards) and Shou (longevity). Fu governs chapters one through three, on blessings, marriage, and children. Lu governs chapters four, five and six, on passing exams, gaining official rank, and obtaining wealth. Shou governs chapter seven, on longevity. Three additional chapters survey motifs for peace, wish-granting, and festivals.